MaryAnn Picone, MD, is a board certified neurologist with over 20 years of experience in the field of multiple sclerosis. She is widely recognized for her clinical expertise, research acumen and comprehensive approach to patient care. Dr. Picone has been Medical Director of the MS Center at Holy Name Medical Center since 1993, and is a member of the Clinical Advisory Board of the New Jersey Metro Chapter of the National Multiple Sclerosis Society. She has been named as a Top Doctor by Castle Connolly. 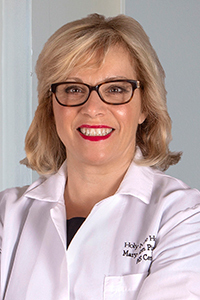 Dr. Picone earned her medical degree and completed residency in neurology at the former University of Medicine and Dentistry of New Jersey – New Jersey Medical School, now Rutgers Biomedical and Health Sciences. Dr. Picone went on to complete a neurophysiology fellowship at Robert Wood Johnson Hospital in New Brunswick, New Jersey. She is currently an Assistant Professor at Touro University Osteopathic School. Dr. Picone also served on the faculty of the University of Medicine and Dentistry of New Jersey – New Jersey Medical School and at Robert Wood Johnson Medical School in Piscataway, New Jersey. As principal investigator for numerous studies, Dr. Picone has participated in clinical research focusing on disease modification of MS, symptom management, psychosocial interventions, and quality of life improvement for patients and families.